Twitch made its way to Long Beach for its annual TwitchCon convention. For their after party they wanted a fun and interactive event where the Twitch creators and community could celebrate an incredible year. We were so excited they chose Hotel Maya to host their event! It has the perfect location with a large pavilion and outdoor space to accommodate all 1600+ guests. And of course the ocean view was an added bonus! Lighting was one of our favorite elements from the event. We incorporated purple lighting to keep the space on brand, added some texture to the space with patterns on the ceiling and added giant logos shining on the walls of each space. 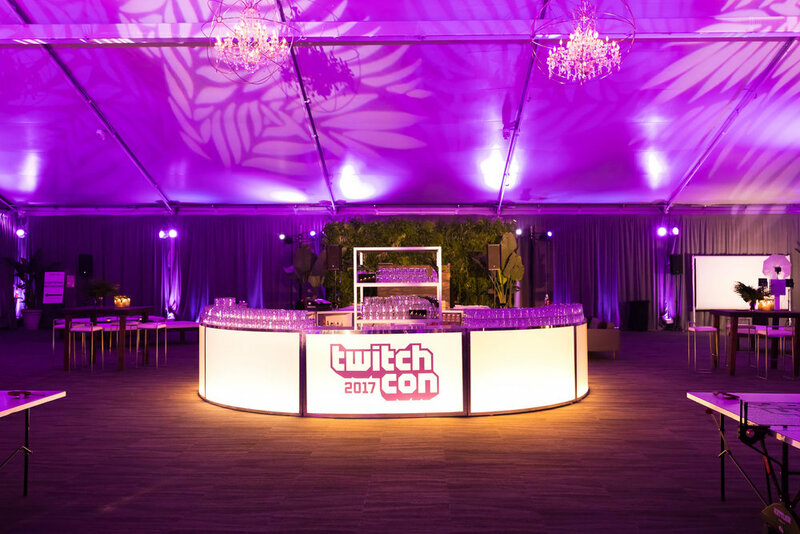 The staple of the event was the over-sized circle light up bar in the middle of the room with Twitch logos all around. The perfect way to end a long conference day is with a drink in your hand and an entire community of supporters around you. With over 1600 guests it was important to Twitch to keep them entertained throughout the night. We brought in multiple games, everything from small table top board games to one of the largest foosball tables on the market. Of course we added some corporate branding to games like ping pong and corn hole. With a packed house the entire event and one of the longest lines we have ever seen, it’s safe to say the event was a HUGE success!